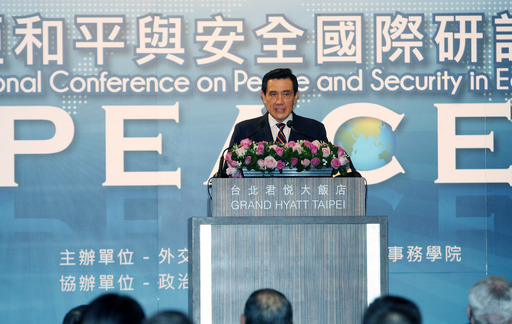 Taipei, Feb. 26 (CNA) President Ma Ying-jeou on Wednesday urged that multilateral negotiations be held to set up an East China Sea code of conduct amid moves by China to assert territorial claims in the region. Speaking at a one-day international regional security conference in Taipei, Ma urged all sides involved to address disputes through peaceful means to ensure regional stability and together come up with a code of conduct on the use of air space and waters in the East China Sea. He also called for a multilateral negotiation mechanism in the region to be established as soon as possible to address air defense identification zone (ADIZ) disputes, a move he said would promote cooperation and help achieve regional peace and prosperity. "If necessary, provisional measures could be adopted to avoid conflict and miscalculation and reduce the impact on freedom of flight and security," Ma said. Drawing on the spirit of the East China Sea Peace Initiative, Ma also urged all sides involved to abide by international law and ensure freedom of flight in the region. The peace initiative, proposed by the president in August 2012, calls for all sides concerned to shelve differences and jointly explore resources to address territorial disputes over the Diaoyutai Islands in the East China Sea, which are claimed by Taiwan, Japan and China. Based on the initiative's principles, Ma said, Taiwan was able to sign a fishery agreement with Japan last April that allows fishermen from the two countries to operate freely in a designated area in the two sides' overlapping exclusive economic zones in the East China Sea. "This demonstrates the idea that sovereignty cannot be divided but resources can be shared," he said. Taiwan also used peaceful means to address a dispute with the Philippines over the death of a Taiwanese fisherman who was shot by Philippine Coast Guard personnel last May while his vessel was operating in the two countries' overlapping waters, Ma said. Noting the rising tensions in the East China Sea, Ma said East Asia is at an important crossroads, poised on the one hand to pursue peace and prosperity but also vulnerable to being plunged into difficulties and disputes. It is up to the leaders in the region to decide on the area's future, he said. China rankled other countries with interests in the region when it declared an ADIZ over the East China Sea that covered the uninhabited Diaoyutai Islands, which are also claimed by Taiwan and Japan, and islands claimed by South Korea. The move was described by the United States as a provocative step and Japanese Prime Minister Shinzo Abe called it a destabilizing measure that "unjustly infringes on freedom of flight over the high seas." Beijing has also taken aggressive actions, such as sending military vessels and aircraft on missions near the Diaoyutais, to press its claims to the islets. The one-day international conference has brought together experts from Australia, Japan, South Korea, Indonesia, Thailand, Singapore, New Zealand, the United Kingdom and the United States to discuss regional security in East Asia and ADIZ issues with local experts. Headlining the participants is John Hamre, a former U.S. deputy secretary of defense who is now president of the Center for Strategic and International Studies, a Washington-based think tank. Also attending are Lin Chong-pin, Taiwan's former deputy defense minister, and Andrew Yang, Taiwan's former defense minister and now secretary-general of the Taipei-based Chinese Council of Advanced Policy Studies.